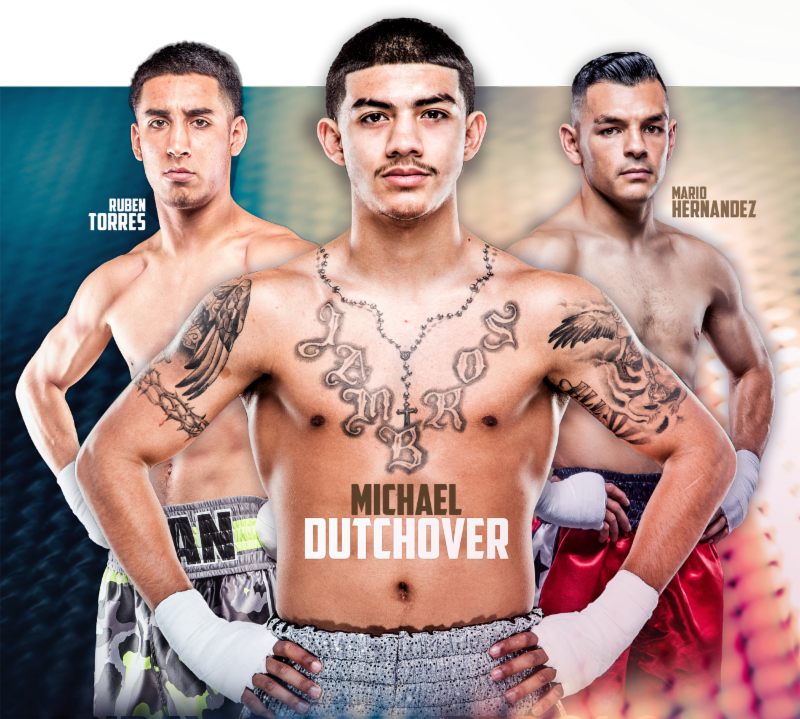 Michael Dutchover (10-0, 7 KOs), a fast rising talent in the junior lightweight division, headlines a prospect rich card on Friday, Sept. 21, from the Doubletree Hotel in Ontario, Calif.
Dutchover collides with once-beaten Luis Alberto Lopez (12-1, 5 KOs) of Mexico in the “New Blood” 8-round main event. Dutchover, 20, hails from Midland, Tex., but has relocated to Santa Fe Springs, Calif. to take advantage of the rich sparring readily available to him in the greater Los Angeles area. To prepare for Lopez, Dutchover has been clocking rounds against current WBA super bantamweight champion Danny Roman. The former cross country standout at Midland High School credits the elite level sparring for his rapidly evolving game. Dutchover’s patience was on display in his latest outing, a second round, one-punch destruction of Sergio Martinez in July. For his fight against the little known Lopez, Dutchover will rely on the experience he’s built up to this point. In the “New Blood” co-feature, entertaining bantamweight Mario Hernandez (7-0, 3 KOs) of Santa Ana, Calif. meets Ivan Gonzalez (4-1-1, 1 KO) of Mexico City, Mex. (6-rounds). The undefeated Hernandez is coming off his most impressive win to date – a unanimous decision win over the previously unbeaten Jonah Flores in July. Hernandez, 27, has developed a reputation as a fierce puncher with boxing skills to match. The volume puncher plans to stick to what he does best against Gonzalez. Unbeaten lightweight prospect Ruben Torres (6-0, 5 KOs) of Los Angeles hopes to continue his winning ways against Mexico’s Eder Amaro (6-5, 2 KOs) in a fight scheduled for 6-rounds. The 20-year-old Torres, who is studying kinesiology at Cerritos College, has shown excellent promise in his brief career that began last August. The lanky striker stands at nearly six feet tall, which provides him with a distinct reach advantage against virtually any opponent. Also on “New Blood,” junior lightweight Bogar Padilla (1-2) will face an opponent to be named later (4-rounds). Opening “New Blood” is lightweight David Ortiz of Bloomington, Calif. He makes his professional debut against Keith Carson (0-1) of Riverside, Calif. in a bout set for 4-rounds. For more information, please visit ThompsonBoxing.com. To follow the conversation on social media, please use #NewBlood #TBPresents, and #ThompsonBoxing.